The Wesak is a Full Moon Festival occurring during the sign of Taurus (April 20 - May 20). An ancient legend says the Buddha, for a brief period, renews His touch and association with the work of our planet at this time. This Full Moon Festival of the Buddha releases forces of enlightenment from our highest spiritual planetary center, Shamballa. These forces spark initiation and are stepped down for humanity through the Buddha, the Christ and the Spiritual Hierarchy. The Wesak Festival, a time when the Buddha and the Christ come together in a sacred ritual, is spiritually known to be the supreme moment in the annual cycle. Tim Boyle imaged the Moon shining behind a large statue of Buddha in Tsukuba, Japan. Boyle captured this view about 1 mile from the statue February 2, 2007. No explanation was given for the red "flame" above the Buddha's head. Each spring during the sign of Taurus, we have the opportunity to tap into the channel of direct communication between humanity and Deity, and celebrate the evolutionary blessings that come to all of humanity. It is important that groups of all faiths unite globally to invoke the divine in everyone. Together we are the Chalice, the Holy Grail on Earth, prepared to receive the outpouring of potent energies from on High. In 2018 the Wesak Full Moon occurs Sunday, April 29, at 5:58pm PDT (00:58 UT April 30). The Wesak Full Moon always occurs in the constellation of Libra the Balance. Libra was once a part of two constellations, Scorpius and Virgo. The map below shows these 3 constellations. During the time of Julius Caesar the Romans created Libra as the twelfth constellation to represent Roman justice. They made the two bright Zuben stars, the two pincer claws of Scorpius (Chelae in this image), into the arms of Libra the Balance. Libra was once considered the scales of the goddess of Justice, which Virgo the Virgin represented. The Wesak Moon moves eastward, toward the constellation Scorpius. Retrograde Jupiter (Mar. 8-July 10) heads westward toward Spica. Note: For those living in San Francisco the exact Full Moon takes place unseen, below the eastern horizon. The Moon is located in the same constellation for other parts of the world; this constellation, in differing time zones, lies in a different location above or below the horizon. In San Francisco the Wesak Moon rises Sunday evening, April 30, at 7:49pm. Jupiter rises a little less than an hour after the Moon at 8:35pm. See Rise/Set Times ~ Major Bodies for your area. Libra demands justice and the perfect point of equilibrium, where neither spirit nor matter dominates. It's as if the "missing pincer claws" of Scorpius create Libra's razor-edged path. The Libran Way synthesizes duality with compassion and the right use of opposites. Libra leads between the two great lines of force, allowing the scales of justice to come into balance. Jupiter is retrograde during the entire Wesak lunar cycle (April 15 - May 15, 2018). A planet in retrograde motion is in a close approach to Earth, as a result it appears bigger and brighter than normal and has a strong effect on the consciousness of humanity. Jupiter began its 2018 westward retrograde motion March 8. May 8 Jupiter is at opposition with its closest 2018 Earth approach May 10. The planet ends its retrograde and is stationary direct July 10, 2018. Jupiter retrograde in a close proximity to the Earth, potently influences humanity. It is said that Jupiter transmits cosmic forces into our solar system. Jupiter bridges, fuses and blends, freeing us from duality. This giant planet expands our hearts and minds bringing out the best in all, producing wisdom and the externalization of the Divine Plan and our Divine Destiny in this solar system and beyond. Retrograde Jupiter gives humanity the opportunity to re-examine what has meaning in life. During this time we are drawn within to reflect upon and re-evaluate our ethical and moral behavior in regards to creating a truly meaningful life, the life that is in alignment with our innate essential Divinity. Note: Due to Jupiter's retrograde motion (westward) and prograde motion (eastward) the planet remains in the constellation Libra until November 18, near its two brightest "Zuben" stars, representing Libra's razor-edged path, discussed above. Find these stars and Jupiter in the map above. Look Up! 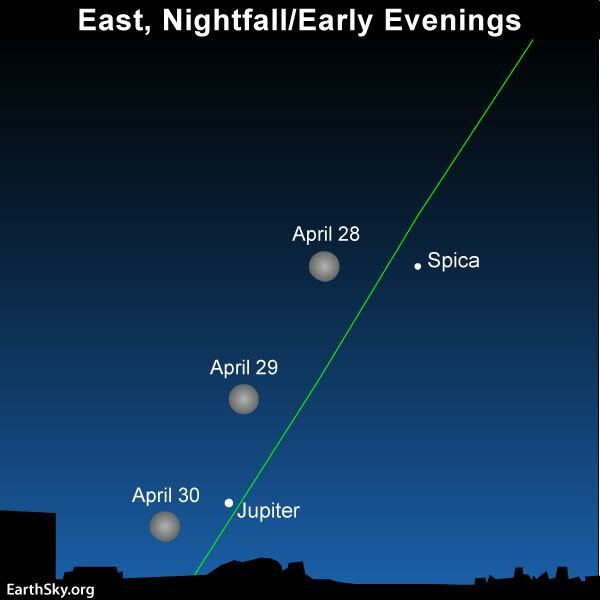 Watch Jupiter transit these stars over several months. Look within and imagine your heart and mind expanding to bring out the best in all. At the spiritual high point of the year, when the Forces of Enlightenment pour into the world and the fires of initiation rage, the Wesak Full Moon is demanding we balance upon the razor-edged path of spirit and matter. As we look for unity beyond duality, we begin to synthesize the pairs of opposites with compassion. Spirit and matter come into a balance where neither dominates, enabling us to bring forth "cutting edge" ideas, make spiritually aligned choices, and take action that transforms our world. Retrograde Jupiter, in a close approach to Earth, potently impresses us now to re-evaluate our ethical and moral behavior. Jupiter, intimately linked with Love/Wisdom, blends the dualities of the heart and head. Jupiter quickens humanity by expanding our hearts and minds to align with our Divine nature. Jupiter positioned in the constellation of Libra until November 18 continues to bring an emphasis to humanity's balance upon the razor-edged path of spirit and matter. The Full Moon during the sign of Taurus provides an opportunity for enlightenment, to attune to the penetrating Light of the Path. This is a time of the illumined mind. The Wesak Moon opens a channel of direct communication between humanity and Deity. Unity or oneness with Divinity enables humanity to rise up from the initiatory fires, blessed and whole. The Full Moon during Taurus is an opportunity to participate in an ancient, living, sacred ritual and celebrate the blessings that come to all of humanity at this time. It is important that groups of all faiths unite globally, invoking the divine in everyone. Together we are the Chalice, the Holy Grail on Earth, prepared to receive the outpouring from on High. the Festivals of Easter, Wesak and Goodwill. Through The Buddha, the wisdom of God streams forth. Through The Christ, the love of God manifests in humanity. humanity each Wesak. Be Blessed!